Ultimate Questions started in the spring of the year 2000, with the aim of bringing the importance of Biblical Creationism to the attention of the general public. 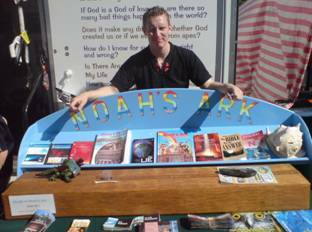 A purpose built display trailer is used, which contains resources on a wide range of topics such as, science and the Bible, the fossil record, the worldwide flood and dinosaurs. There are questions on the doors of the trailer to provoke people to think about some of the important issues relating to origins. One door contains more matter of fact questions such as "Who was Cain's wife? ", while the other door contains questions regarding people's world view, such as "Is there life after death?" This has proved to be a very useful way to attract attention and draw people into conversation. The first verse of the Bible (Genesis 1:1) is also on one door and 2 Corinthians ch5 v17 on the other door to let people know what we stand for. A life size baby allasaurus was acquired that children could sit on and have a photograph taken. This photograph was placed on a card containing information about dinosaurs and a simple gospel message. However, in more recent times the interest in dinosaurs has faded and the model has been made extinct for the time being. A scale model of Noah's ark (90:1) was built with people to the same scale standing on the ark model. This has proved to be a very good tool in gaining the attention of people walking past and helps to develop a conversation with them. Many people are astonished at the shape and size of the ark and even where the measurements came from! Events attended include agricultural shows, vintage and steam rallies, Bible weeks, pipe band contests, open air concerts and fun days. The response as expected has been very mixed ranging from a very few antagonistic people, to some eager enquirers, to many who are apathetic. There have been many interesting conversations and contacts made with a diverse range of people with lots of views on issues about origins. Many of the people stopping with us have been Christians, but increasingly we are engaging with those who need to be saved. What has been accomplished over the years? Only eternity will reveal. Lots of creation resources distributed, lots of conversations, lots of people who saw the questions, but didn't stop to get an answer. Our prayer is that people will get over the obstacle of evolution and trust in the Creator as Saviour. The Ultimate Questions Creation Trailer is normally in operation during the spring and summer months. 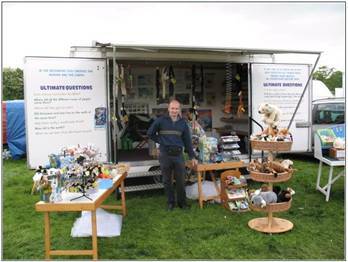 If you would like to invite the Ultimate Questions Creation Trailer to an event that you are running then please contact us.